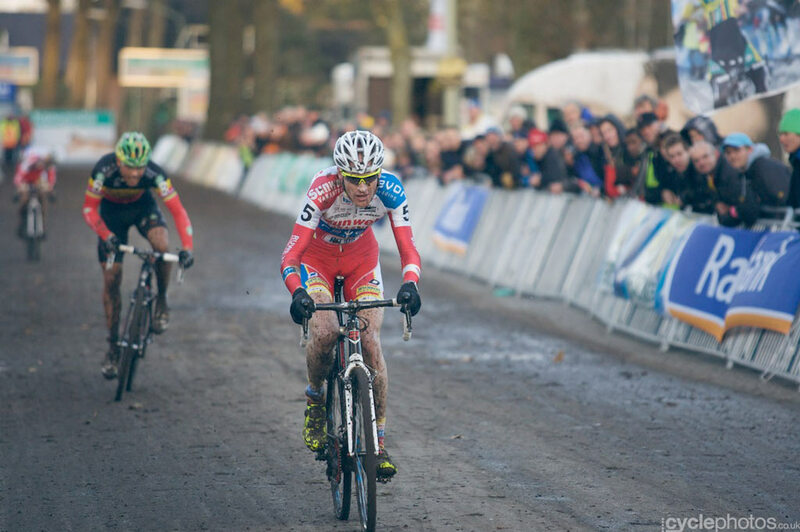 Hokay, new column/category/whatevs: Weekend CX Ronden. Unfortunately, I seem to be locking myself into a weekly post obligation and we all know that’s a horrific idea on my part. 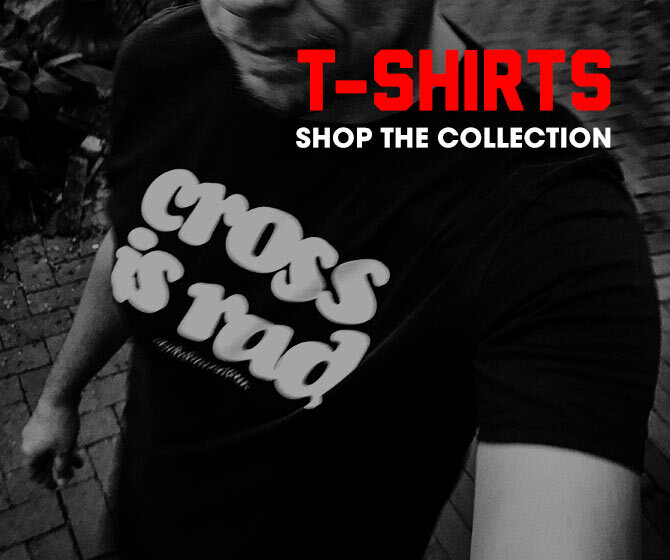 So yeah, new feature post—Weekend CX Ronden voor November 24-25. In convincing fashion (is there any other fashion in which Sven rides? 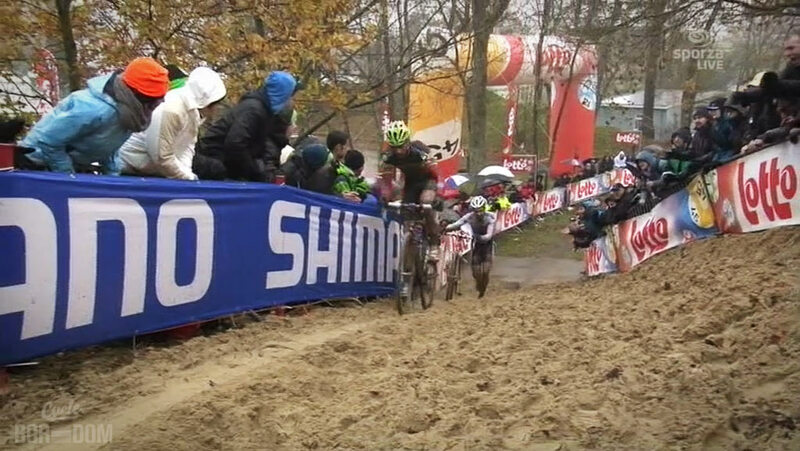 ), the Nys one—Sven Nys destroyed the field yet again after a lengthy come back on the sandy straights of World Cup #3 – Koksijde. Kop van de wedstrijd voor most of the race, Niels Albert started looking shaky once Sven caught him, but a series of events brought about his destruction. First, Niels lost control on the sloppy section leading to the sand hill allowing Sven to come by. Staying upright, Albert attempted to stay on Sven’s wheel. However, once they hit the hill, the same hill Niels rode all day, he dismounted from lack of speed/power. As Sven came through and muscled up the hill all Niels could see was his nemesis and the win riding away. Once remounted, #Svenness already had the win on lock. A visibly dejected Niels prompted Sporza’s Michel Wuyts to exclaim in plain English, “mental breakdown.” Yup. Not to be outshone by the Nys & Niels show, Francis Mourey got himself a fancy podium spot, crossing the line in third for a huge result! Katie Compton crushed the women’s Koksijde field by over a minute. She finished with a gaap of 1:27 to an on-fire Niki Harris. The sand is Katie’s friend. Unfortunately, the meager 10 second replay of the women’s race didn’t provide much more info than this. Le sigh. Klaas Vantornout barely edged Sven Nys in the strangest “sprint” of the entire season at Superprestige Gieten in the Netherlands. Gieten is a strange course. And that strangeness was exacerbated by the ungodly wind ripping across the open space. The wind stretched course tape bore witness to the trio of Sven Nys, Klaas Vantornout, and Kevin Pauwels battle it out over the last few laps. It looked as though Sven was about to add another shower head to his collection when, incredibly, he fuxed a micro hill and a micro turn just before the finishing straight allowing Klaas to seemingly cruise in voor de overwinnings. Yet Klaas, unaccustomed to this position at this point in the race, was a little too cruisey inviting #Svenness to a two-up sprint. Luckily, my screaming at the computer screen helped Klaas with the bike throw to take the win. However, my excitement at Klaas’ overwinnings was soon tempered as none other than Adam Meyerson called out Sven for throwing the race. I wonder how much that show cost Mettepenningen? Not long after, Ben Berden said the same thing. Nys the best cx rider ever. The worst actor ever. Sold cx race. Update: Apparently the België press pays attention to social media. Ben’s tweet got some attention today. Special mention for Jonathan Page coming in at a spectacular 15th place. He’s slowly making his way up in the finishes. 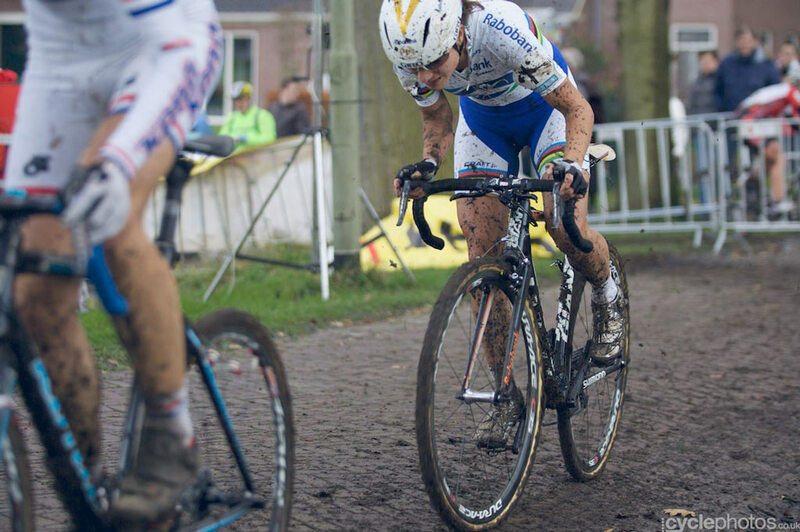 Helen Wyman took her fantastic form into Gieten and introduced it to Marianne Vos. Then she promptly dropped the reigning World Champion to take the overwinnings in Gieten. Rather than rehash someone else’s work for a race I didn’t see, I’ll direct you to Podium Insight. They have, as usual, a great recap, results, and images.